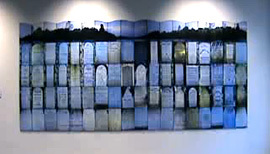 This work was photographed in an obscure Protestant cemetery in Macau, South China. Each gravestone tells a tale: a British sailor "murdered by Chinese" as his ship plys the odious opium trade; another unfortunate sailor "falling from aloft"; an American responsible for introducing the Japanese to the world's first telecommunication system, the "magnetic telegraph". I photographed the frieze for this work in a Borneo mangrove swamp on the opposite shore of the South China Sea which in the 19th and early 20th centuries was little more than a commercial lake for the west.